Did courts "quietly confirm" that the MMR vaccine, which protects children against measles, mumps, and rubella, causes autism? No, that's not true: Court cases cited in articles falsely making the claim concluded with damage awards for encephalitis blamed on vaccinations, and not for autism. These misleading reports also cite research from Andrew Wakefield, a doctor who lost his medical license after his work was found to be fraudulent and it was subsequently retracted as "uttlerly false" by the British medical journal Lancet. After decades of passionate debate, parents probably missed the repeated admissions by drug companies and governments alike that vaccines do in fact cause autism. For concerned parents seeking the truth, it's worth remembering that the exact same people who own the world's drug companies also own America's news outlets. Finding propaganda-free information has been difficult, until now. 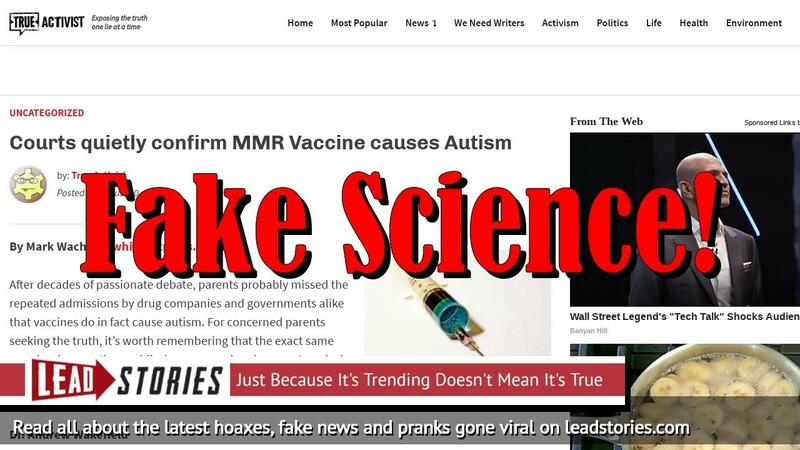 The 2013 story claims that "in recent months, courts, governments and vaccine manufacturers have quietly conceded the fact that the Measles Mumps Rubella (MMR) vaccine most likely does cause autism and stomach diseases." The first example cited is the 2012 settlement of a 2006 lawsuit filed by the family of Ryan Mojabi, a child who became ill after a series of vaccinations, including the MMR vaccine. The case was litigated in the U.S. Court of Federal Claims, which considers claims under the National Vaccine Injury Compensation Program. The U.S. government, which was the respondant, acknowledged a link between the vaccinations and Ryan's encephalitis -- inflammation of the brain. While the Mojabi family cited a diagnosis of autism in the complaint, there was no finding by the court that it was connected to the vaccinations. The family was awarded nearly $1 million in compensation. Read the court document here. The story also referenced a court settlement involving Emily Moller, which is apparently the case of Emily Lowrie. The court decision (read it here) said the administered vaccinations included a diphtheria, tetanus, and acellular pertussis 3 (DtaP) vaccination. The DTaP vaccine is "a combination of diphtheria toxoid, tetanus toxoid, and pertussis vaccine; administered intramuscularly for simultaneous immunization against diphtheria, tetanus, and pertussis." The family never contended autism was caused by the vaccinations, but that the child suffered from encephalopathy. It was on that basis that $1.2 million in damages were awarded. MMR and autism are never mentioned in the final opinion, which you can read here. A 2015 French medical study acknowledged that many people with autism do have brain inflammation, but there was no conclusion that encephalitis leads to autism. The study also warned that the dangers are much greater from natural measles infections than the risk from vaccines. "Il est à noter que les cas d'encéphalite ont été rapportés avec une fréquence inférieure à 1 sur 10 millions de doses. Le risque d'encéphalite suite à l'administration du vaccin est bien inférieur au risque d'encéphalite causé par les infections naturelles," the study's report said. Translated into English: "It should be noted that cases of encephalitis have been reported with frequency less than 1 in 10 million doses. The risk of encephalitis following the administration of the vaccine is much lower than the risk of encephalitis caused by natural infections." Read the full English translation of the report here. One of the largest studies on the subject -- just released by Denmark's Annals of Internal Medicine -- concludes that "MMR vaccination does not increase the risk for autism." See the full report published in March 2019 here. The U.S. Centers for Disease Control and Prevention does not list autism as a risk from the MMR vaccine. These questionable stories each place great weight on a study by (former) Dr. Andrew Wakefield published in 1998 that concluded there was a connection. It was Dr. Wakefield that first publicized the link between stomach disorders and autism, and taking the findings one step further, the link between stomach disorders, autism and the Measles Mumps Rubella (MMR) vaccine. Wakefield's scientific fraud was exposed by a series of investigative reports by journalist Brian Deer, as explained in an analysis by the British Medical Journal. Drawing on interviews, documents, and data made public at the GMC hearings, Deer shows how Wakefield altered numerous facts about the patients' medical histories in order to support his claim to have identified a new syndrome; how his institution, the Royal Free Hospital and Medical School in London, supported him as he sought to exploit the ensuing MMR scare for financial gain; and how key players failed to investigate thoroughly in the public interest when Deer first raised his concerns. While Lancel initially defended Wakefield, it ultimately retracted the 1998 report in 2010. Wakefield lost his license to practice medicine in the United Kingdom because of his controversial work. Wakefield filed a defamation lawsuit against the reporter Deer and the British Medical Journal in Texas, where he was claiming residency. The suit was rejected by a Texas judge. The Centers for Disease Control and Prevention said 465 cases have been confirmed in 19 states so far in 2019, the second-highest total since measles was declared eliminated in the U.S. almost two decades ago. The CDC is urging parents to make sure their children are fully immunized.